Bartonellae are highly adaptive organisms that have the ability to evade the host immune system and cause persistent bacteraemia by occupying the host's erythrocytes. Bartonella spp. is under-studied and health care professionals often misdiagnose Bartonella-related infections. The aim of this study was to investigate the carriage of Bartonella spp. circulating in human and animal populations in Gauteng using culturing and polymerase chain reaction (PCR) detection. A total of 424 human, 98 cat, 179 dog, and 124 wild rodent blood samples were plated onto specialised media and incubated for 7-21 days at 37 °C in CO2. Culture isolates morphologically similar to Bartonella control strains were confirmed by PCR and sequenced to determine species. Deoxyribonucleic acid (DNA) was extracted from all blood samples and tested by nested PCR. Bartonella could only be cultured from the cat and rodent specimens. Cat isolates were > 99% similar to Bartonella henselae URBHLIE 9, previously isolated from an endocarditis patient, and rat isolates were > 98% similar to either RN24BJ (candidus 'Bartonella thailandensis') or RN28BJ, previously isolated from rodents in China. The PCR prevalences were 22.5% in HIV-positive patients, 9.5% in clinically healthy volunteers, 23.5% in cats, 9% in dogs and 25% in rodents. Findings of this study have important implications for HIV-positive patients. Bartonella fall within the alpha-2 subgroup of the class Proteobacteria (Jacomo, Kelly & Raoult 2002). Recent studies have indicated that Bartonella species (spp.) have some degree of relatedness to other alpha-2 Proteobacteria including Brucella species, Afipia species, Agrobacterium tumefaciens, Bradyrhizobium species, and Bosea species (Duncan, Maggi & Breitschwerdt 2007; Greub & Raoult 2002; Houpikian & Raoult 2001; Jacomo et al. 2002; Pretorius, Beati & Birtles 2004; Rolain et al. 2004). Current knowledge suggests that there are more than 20 species and subspecies included within this genus (Márquez et al. 2008). Approximately 13 species have been associated with human diseases (Pérez-Martínez et al. 2009; Maggi et al. 2009; Pons et al. 2008) affecting both immunocompetent and immunocompromised individuals. At least six species affecting humans have been isolated from domestic cats and dogs (Chomel et al. 2006). 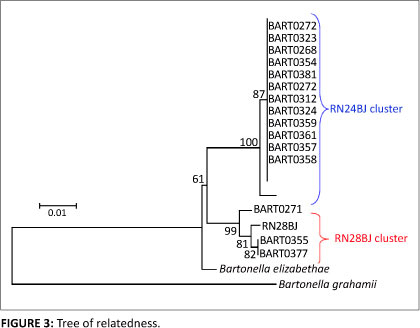 Bartonellae are pleomorphic, fastidious, oxidase-negative, Gram-negative bacilli (Jacomo et al. 2002; Maurin & Raoult 1996). Bartonella species growth is hemin-dependent (Wong et al. 1995), therefore the addition of hemin-rich rabbit blood or horse blood to the agar yields better growth than sheep blood (Jacomo et al. 2002). Growth occurs on enriched medium at 37 °C with 5% carbon dioxide (CO2); however, growth also occurs in broth with fetal bovine serum, and in various tissue culture systems including cell lines (La Scola & Raoult 1999). On average primary isolates appear after 12 to 14 days (Jacomo et al. 2002), although it has been reported that primary isolation can take up to 45 days (Maurin et al. 1994). Subcultured colonies have been found to appear after only three to five days (Jacomo et al. 2002). In this study, human immunodeficiency virus (HIV) positive people, clinically healthy volunteers, impounded cats, impounded dogs, and commensal rodents were investigated for carriage of Bartonella spp. The objective was to determine the rates of infection in the study groups and to determine the species responsible for infection in the study populations. Various studies have been carried out globally to determine the prevalence of Bartonella spp. in humans and animals. There is very little data available for the culture or molecular prevalence of human Bartonella. The lowest prevalence reported in humans was 3% and the highest was 33.3%, in the USA (Breitschwerdt et al. 2007; Bonilla et al. 2009; Koehler et al. 2003). The prevalence in cat populations was from as little as 2% in Canada (Kamrani et al. 2008) to as high as 53% in France (Heller et al. 1997), in dog populations from 0% in the United Kingdom (Birtles et al. 2002) to 16% in Korea (Kim et al. 2009), and in rodent populations from 6% in Indonesia (Winoto et al. 2005) to 43.5% in China (Ying et al. 2002). The prevalence of Bartonella spp. is largely unknown in South Africa. There are some case reports of bacillary angiomatosis caused by Bartonella spp. in HIV positive patients (Frean, Arndt & Spencer 2002). A non-random pilot survey of outpatients of three Johannesburg HIV clinics has been done on a relatively small sample group (n = 188 patients). This study showed a 10% prevalence of Bartonella henselae in blood of HIV-positive patients, determined by nested polymerase chain reaction (PCR) (Frean et al. 2002). A prevalence study in domestic and wild felines in southern Africa published by Kelly et al. (1996) reported 23% (n = 171) prevalence. A study of rodents in South Africa showed a high rate of infection (44%) with a wide range of subtypes of bartonellae (Pretorius et al. 2004). Ethical approval for collection of samples from humans and animals was granted by the Human Research Ethics Committee (Medical) of the University of the Witwatersrand (Ethics Approval Number: M070637), the National Health Laboratory Service Animal Ethics Committee (Ethics Approval Number: 2007/112), and the University of the Witwatersrand Animal Ethics Screening Committee (AESC) (Ethics Approval Number: 2008/56/03). A convenience sample of 382 HIV-positive patients was recruited from the Chris Hani Baragwanth Hospital (Soweto, Gauteng), HIV-clinic. HIV-status was known as the clinic only treats HIV-positive patients. Specimen collection started in September 2007 and was completed by the end of January 2008. Survey objectives and consent forms were explained to prospective participants by an available HIV-counselor employed at the clinic, a laboratory aid or by the phlebotomists drawing the blood samples. Patients were assured that the study was voluntary and results would not directly benefit nor disadvantage them in any way. Informed consent forms were completed by the participating patients before blood collection. The recruited volunteers were provided with an information sheet containing the contact details of the Special Bacterial Pathogens Reference Laboratory (SBPRL) at the National Institute for Communicable Diseases (NICD) to which queries were addressed. Clinically healthy volunteers were recruited from the National Institute for Communicable Diseases and a local animal shelter for blood collection. Due to ethical considerations, the volunteers were not required to disclose their HIV status, and health was assumed on the basis of no observable signs of illness at the time of blood collection. These volunteers were also required to complete an informed consent form and participation was completely voluntary. Two 4 mL tubes of blood were collected from each volunteer, 1 tube containing the anticoagulant ethylenediaminetetra-acetic acid (EDTA) and the other a plain red-top tube in which the blood was allowed to clot. Blood specimens were stored at minus 20 °C until use. Blood was collected from dogs and cats that were undergoing euthanasia, surgery or sterilisation procedures at a local animal shelter. Two 2-mL tubes of blood (as described above) were collected from each cat and dog. Samples were stored at 4 °C until use. Rodents were prospectively sourced from a pest control company operating in the Ekurhuleni Metropolitan area. Rodents were trapped alive, anaesthetised using CO2, and exsanguinated by cardiac puncture. Blood was collected using a syringe and needle from each rodent and was divided into two tubes, one red top and one purple top (as above). Specimens were stored at 4 °C until use. All blood samples were plated onto 5% rabbit blood-supplemented Columbia agar (hereafter referred to as Bartonella medium). Culturing was carried out in a class two biohazard safety cabinet to reduce the risk of contamination. Ethylenediaminetetra-acetic acid blood was predominantly used for culturing, unless the EDTA specimen was insufficient (especially for cat and dog samples), in which case some of the clotted blood (packed cells excluding serum) was used. Approximately 100 µL - 150 µL of each whole blood sample was inoculated onto fresh Bartonella media and spread over the surface using sterile glass spreaders. Inoculated media were incubated in 5% CO2 at 37 °C for seven ± two days before being checked for growth. If small dry colonies, pitting into the media were present, they were Gram stained, and plated out onto fresh media. Media with faint or no growth were re-incubated as above to a maximum of two months with periodic examinations every seven days. All blood culture isolates were confirmed by PCR and stored in tryptic soy broth (TSB) with 10% (v/v) glycerol at minus 80 °C. All culture isolates and blood samples were tested by genus specific PCR amplification of the intergenic spacer (ITS) region between the 16S and 23S rRNA genes for evidence of Bartonella Deoxyribonucleic acid (DNA). Deoxyribonucleic acid extractions were carried out using the QIAamp DNA mini kit (Qiagen, Germany) as per kit protocol. Published genus-specific primers were selected as shown in Table 1 (Roux & Raoult 1995; Seki et al. 2006). The reverse primer QHVE-14 (Seki et al. 2006) was modified by elongating the 5' end by three nucleotides to decrease nonspecific amplification. Polymerase chain reaction confirmation of cultured isolates was carried out using primers QHVE-1 and QHVE-3, whereas the blood-extracted DNA required a nested PCR using the QHVE-12 and QHVE-14b inner primers. Table 2 shows the primer binding localities and product sizes of the six most commonly isolated human Bartonella spp., although other species within the genus are also detectable using these primers. The single or first round PCR amplifications were carried out in a reaction mixture (50 µL) containing 20 pmol of each primer (QHVE-1 and QHVE-3), 1 x Buffer II, 2 mM MgCl2, 1.5 U AmpliTaq DNA polymerase (Applied Biosystems, USA), 200 µM of each deoxyribonucleotide triphosphate (dNTP) (Thermo Scientific, United Kingdom), and 1% (v/v) Triton-X 100 surfactant additive. The amount of DNA was used depended on the source of the DNA. For the culture DNA, 20 ng of template was included into the reaction, whereas 5 µL of the total blood extracted extracted DNA was included into the reaction. Polymerase chain reactions were performed on a VERITI Thermocycler (Applied Biosystems) under the following conditions: 2 min initial denaturation step at 94 °C, followed by 35 cycles of the following steps: denaturation at 94 °C for 30 s, primer annealing at 52 °C for 30 s, and elongation at 72 °C for 60 s. A final elongation step concluded the amplification at 72 °C for 6 min. Polymerase chain reaction products were maintained at 4 °C until being added to the reaction mixtures of the nested round. For the nested PCR reactions, a final volume of 50 µL consisted of 2 µL of first-round product, 1 x Buffer II, 1.5 mM MgCl2, 30 pmol of each inner primer (QHVE-12 and QHVE-14b), 200 µM of each dNTP, and 1.5 U AmpliTaq DNA polymerase. The reactions were amplified as previously described, with a variation in the annealing temperature (55 °C). Amplicon analysis was performed on a 2% (w/v) Tris-acetic acid-EDTA (TAE) buffer agarose (WhiteSci, USA) gel, supplemented with 0.5 µg/mL ethidium bromide. Electrophoresis was carried out at 100 V in 1 x TAE for 40 min. Gels were visualised by ultraviolet illumination. The culture isolates were speciated by sequencing of the ITS region using the outer primers (QHVE-1 and QHVE-3). Amplicons were gel purified using the QIAquick Gel Extraction Kit (Qiagen, Germany) as per manufacturer protocol and sent to Inqaba Biotechnologies for direct sequencing. Sequences were aligned and analysed using BioEdit freeware (http://www.mbio.ncsu.edu/BioEdit/bioedit.html). Sequences were exported into the National Center for Biotechnology Information (NCBI) website's Basic Local Alignment Search Tool (BLAST) database for species identification of the isolates. A tree of relatedness was drawn using the neighbor-joining method (Saitou & Nei 1987) of molecular evolutionary genetics analysis (MEGA4) freeware (http://www.megasoftware.net/) (Tamura et al. 2007). A total of 382 HIV-positive patients attending the HIV clinic volunteered to take part in this study; 246 (64%) were women and 136 (36%) were men. Ethylenediaminetetra-acetic acid blood samples (whole blood including plasma) were plated out after having been freeze-thawed from minus 20 °C. Blood cultures from this sample group yielded no Bartonella spp. isolates. Approximately a third (130/382) of the blood cultures were contaminated by fungal or environmental bacteria growth due to the prolonged incubation periods. In order to decrease the amount of contamination, amphotericin B was included in the blood culture technique. To assess the effect of amphotericin B on the growth of Bartonella, the B. henselae ATCC strain was inoculated into BHI broth with 5% (w/v) amphotericin B and plated out onto fresh Bartonella media. Upon assessment, it was observed that although amphotericin B does reduce the amount of fungal contamination, it also suppresses the growth of the control culture. The addition of amphotericin B was therefore discontinued. Due to the low circulating bacterial load often observed in natural infection, the risk of suppression, although slight, was not one worth taking. If a culture became contaminated with fungal growth, the culture was repeated. To ensure that Bartonella was not missed, any cultured organisms were Gram-stained, and any Gram-negative pleomorphic bacilli were sub-cultured and Bartonella was excluded by PCR. A total of 42 clinically healthy volunteers were recruited to determine normal infection rates. Seven animal shelter staff and 35 National Institute for Communicable Diseases' staff members participated in this study. All specimens were freshly cultured onto the Bartonella media. Only one of the 42 blood specimens illustrated growth morphologically consistent with Bartonella spp. Unfortunately, the culture failed to grow on sub-culture. The seven animal shelter volunteers had daily exposure to many different animals. Bartonella spp. infections have been associated with cats and dogs (Barnes et al. 2000; Ketring et al. 2004) and it was therefore expected that this group would be most likely to demonstrate Bartonella bacteraemia. This was not the case in this study, but the sample size was inadequate. Dog (n = 179) blood specimens yielded no Bartonella culture isolates, but cat (n = 98) blood specimens yielded five (approximately 5%) Bartonella culture isolates that were confirmed by PCR. It was concerning that there were so few cultured isolates and that three of the five isolates obtained came from a single batch of seven feline blood samples received from the animal shelter, whereas preceding batches had not yielded culture isolates. To exclude the possibility of cross-contamination within this batch, the blood samples were re-cultured and subjected to PCR confirmation. A total of 124 rodent samples taken from Rattus norvegicus and Rattus rattus were cultured on Bartonella medium. Bartonella was isolated from 16 (13%) rodents. All isolates were Gram-negative, pleomorphic bacilli with morphology consistent with Bartonella. Primary isolation occurred between five and nine days, with sub-cultures growing within four to five days. At least two different colony morphologies (Table 3) were observed for the rodent isolates, and these were later confirmed and identified by sequencing. A total of 21 culture isolates were confirmed as Bartonella by PCR. Amplicon sizes varied between 728 and 809 bp. Polymerase chain reaction of the HIV-positive population yielded a prevalence of 22.5% (86/382) (95% confidence; 18.5-27.1), whereas the clinically healthy group had a prevalence of 9.5% (4/42) (95% confidence; 3.1-23.5). This is a significant difference (p-value: 0.05; chi-square statistic: 3.818 with one degree of freedom) in the proportion of current infection for the two populations. This difference is unlikely to have occurred through mere chance, although the limited healthy volunteer sample size is a major limitation. The feline blood tested by PCR indicated a 23.5% (23/98) (95% confidence; 15.8-33.3) Bartonella prevalence. This was significantly different (p-value: 0.0002; chi-square statistic: 13.500 with one degree of freedom) to the culture prevalence (5%). Both test techniques test for current infection; however, due to the fastidious nature of the bacteria, PCR is the far more efficient method for detection of Bartonella spp. as it does not rely on the viability of the bacteria. The dog PCR prevalence was 9% (16/179) (95% confidence; 5.4-14.4), which is significantly lower than the prevalences in felines (p-value: 0.0009; chi-square statistic: 11.053 with one degree of freedom) and rodents (p-value: 0.0001; chi-square statistic: 14.419 with one degree of freedom). Rat bloods tested by PCR indicated 25% prevalence (31/124) (95% confidence; 17.9-33.7). There was a significant difference (p-value: 0.0151; chi-square statistic: 5.907 with one degree of freedom) between PCR prevalence and culture prevalence (13%). When the prevalence for rats was compared with that of the felines, there was no significant difference (p-value: 0.7918; chi-square statistic: 0.070 with one degree of freedom). Comparison with GenBank (NCBI website) sequences showed that the rodent isolates ranged in percentage similarity from 97% - 99% to either the recently named novel species candidatus 'Bartonella thailandensis' (RN24BJ; accession number: EF190333.1) or RN28BJ (accession number: EF213776.1). Both isolates were described in a recent publication by Saisongkorh et al. (2009) where the rodents in Beijing, China were tested for bartonellae. The rodent isolates were slightly more variable and a tree of relatedness was constructed (Figure 3). Contingent from the ITS data using parsimony and distance methods illustrated two well-supported (more than 90% bootstrap values) clusters within the isolates. The first cluster placed RN24BJ with 12 of the isolates (BART0272, BART0323, BART0268, BART0354, BART0379, BART0381, BART0312, BART0324, BART0359, BART0361, BART0357 and BART0358) and the second group clustered RN28BJ with the remaining three isolates (BART0271, BART 0355 and BART 0377). Bartonella elizabethae (GenBank accession number: L35103) and Bartonella grahamii (GenBank accession number: AJ269785) were used for comparison. Bartonella elizabethae was found to be most similar to the rodent isolates from this study. The five cat isolates were 99% - 100% similar to B. henselae URBHLIE 9 (accession number: AF312496.1). Primers (QHVE1 & QHVE3) amplified a region consisting of 687 bp (excluding primers) for all the feline isolates. BART0480 and BART0483 were 100% identical to the B. henselae URBHLIE-9 strain, and had only one nucleotide difference from B. henselae Houston-1 (accession number: L35101) strain at position 98. BART0519 was 99% similar to URBHLIE-9 with a heterogenous nucleotide at position 285, where adenosine (A) or guanine (G) is equally expressed. BART0519 and BART0484 were identical to each other and 99% similar to URBHLIE-9. One nucleotide difference was observed at position 660. Bartonella remains one of the most difficult organisms to detect via blood or tissue culture. Frean et al. (2002) looked at the prevalence of Bartonella in HIV-positive out-patients at several hospitals in Johannesburg and found a 10% PCR prevalence of Bartonella. A conservative expectation for the present study was to find at least 10% culture-positive specimens for Bartonella spp. Bartonella henselae was first isolated from the bloodstream of an AIDS patient (Regnery et al. 1992a). Severely immunocompromised people are most at risk of contracting a Bartonella infection (Boulouis et al. 2005) and those with bacillary angiomatosis remain bacteremic for a number of weeks (Koehler & Tappero 1993). HIV-infected patients with CD4+ cell counts of less than 50/mm3 are more likely to develop bacillary angiomatosis lesions (Boulouis et al. 2005; Koehler & Tappero 1993), and as a precaution, broad-spectrum antibiotic treatments are periodically prescribed for these patients. The effect of broad-spectrum antibiotics on Bartonella infections lacks clarity. Research has been conducted on in vivo and in vitro antimicrobial sensitivities of Bartonella to various drug classes. In vitro testing has shown bactericidal efficacy, but in vivo tests have demonstrated mostly bacteristatic activity, with the exception of aminoglycosides which are bactericidal (Florin et al. 2008). The bacteriostatic activity of the broad-spectrum drugs may be suppressing circulating bacteremia to undetectable levels for culture. It is probable that the HIV-positive patients we tested were on a range of broad-spectrum antibiotics as prophylaxis against opportunistic infections. Information regarding whether or not these patients were on the antibiotic treatment, the type of antibiotic treatment taken, the prescribed doses, and duration of treatment administered was not collected at the time of specimen collection and is thus unavailable. It was speculated that this would influence Bartonella isolation from the specimens. Published methodologies were followed for culture, including freeze-thawing of the specimens (La Scola & Raoult 1999). The methodologies were later refined as it was discovered that inoculating fresh packed red-blood cell samples onto the Bartonella media yielded better results. Although culture is regarded as the gold standard for detection, it is limited and problematic. The lack of cultured Bartonella in human blood does not indicate that the prevalence is zero, since Bartonella spp. was detected by PCR. This study has shown an even higher Bartonella prevalence (22.5%) in HIV-positive out-patients than the 10% previously reported (Frean et al. 2002). In immunocompromised individuals B. henselae infections are usually associated with exposure to cats and cat fleas (Boulouis et al. 2005; Koehler & Tappero 1993). The highest prevalences found in this study were for cats (23.5%) and rats (25%). These prevalences were not as high as some of the other reports published on the prevalence of bartonellae in animals. Dog and cat samples were stored in the fridge at 4 °C for up to three weeks before being processed. It is hypothesised that Bartonella bacilli (if present in the blood) became non-viable due to prolonged storage time. Supporting this hypothesis is the fact that isolates were obtained from blood specimens that were processed within one week of collection. This is further supported by the fact that PCR detected Bartonella DNA in the blood at a much higher rate than culture (23.5% vs 5%). An interesting finding for the present study was the isolation of B. henselae URBHLIE9 from all five culture-positive cat isolates. This strain was previously isolated from the blood of a patient presenting with endocarditis and implies a strong link between humans and cats as reservoirs for bartonellae (Houpikian & Raoult 2001). Polymerase chain reaction results indicate that there is a high prevalence of bartonellae in human and animal populations in Gauteng Province, South Africa. More work is required to fully understand the extent of disease resulting from these Bartonella infections. Bartonella prevalence for HIV-positive patients in Gauteng was found to be much higher than previously reported. Based on the 22.5% (95% confidence) PCR prevalence, it is speculated that approximately 1 in 4 HIV-positive patients is infected with Bartonella. Although most patients are consistently subjected to broad-spectrum antibiotic treatment, the efficacy of treatment is not known since treatment efficacy varies from patient-to-patient. The fact that 22.5% of the tested samples were PCR positive for Bartonella indicates that the bacteria are present in the host. In vitro efficacy of antibiotic use against Bartonella has been limited (Florin et al. 2008). In most cases antibiotics have had an inhibitory effect rather than a bactericidal one. The lack of cultured isolates from HIV-positive human samples could be attributed to this inhibitory effect. Treatment is onerous as it has to be administered for prolonged periods to suppress infections, such as Bartonella infections. There is limited information on the economic burden of Bartonella infections, since diseases caused by Bartonella are not notifiable. Furthermore, due to the difficulty in diagnosis of Bartonella, infections often go undetected and untreated. Although there are various methodologies available for detection of Bartonella, each method has its own limitations. Most methods are only used for research purposes and highly-skilled laboratory staff. The first test dealt with in this study is culture. Most microbiology laboratories are proficient in this method and culture is generally regarded as the gold standard for most bacterial diagnoses. Culture of Bartonella differs from most conventional bacteria culture as it is more labor-intensive. Fresh EDTA blood must be centrifuged and the pellet is plated onto specialised media supplemented with rabbit blood. Isolation requires a prolonged incubation period from 7-21 days at 37 °C under microaerophillic conditions. Most laboratories do not have the capacity to maintain these cultures for prolonged periods or prevent contamination. Assuming the above conditions are met, there still remains the task of confirmation of the culture as Bartonella. Bartonellae do not visibly metabolise compounds provided in rapid biochemical test panels. Bartonella spp. is oxidase and catalase negative and stain faintly as Gram negative, slightly curved, bacilli. Small diagnostic laboratories often do not have the means of confirming the culture isolate as Bartonella. Polymerase chain reaction has become a relatively affordable option when testing for bacterial diseases, although affordability is relative. A skilled and competent operator performing a PCR may not have problems carrying out the test, particularly if it is a routine test, but if the operator does not routinely perform the test (especially for Bartonella) the method is relatively labour-intensive and prone to contamination. Much research has gone into developing nested PCR, high-tech real-time PCR and amplicon sequencing. These tests remain largely for research purposes only. Staff would have to be trained; primers and other reagents would have to be readily available and expensive equipment such as thermocyclers, electrophoresis power packs and tanks, UV light-boxes, software and computers would have to be purchased and maintained. It is recommended that operator-friendly tests such as the IFA become more affordable for use in laboratories. Perhaps an ELISA as previously described (Bergmans et al. 1997; Vermeulen et al. 2007) would be a more cost effective method. Control culture is relatively easy to grow and the antigens of the culture can be sonicated from the growth and consequently be used to coat the microtitre wells. This method can be optimised and made 'in-house' thus mitigating the need for expensive commercially available kits. Bartonella testing is especially required for immunocompromised patients presenting with clinical symptoms and histories. Training and out-reach programs directed towards doctors and the generally public should be carried out to ensure the indicative symptoms are recognised, and reported when presenting for medical assistance. Pest control and fleas control methods should be advised and implementable solutions should also be discussed. In this study, results were within global trends for Bartonella prevalence in both human and animal populations. The objectives of the study were met and a better understanding of Bartonella prevelance in human and animal populations in Gauteng, South Africa is now available. This study has confirmed that the primary concern is human health, particularly for immunocompromised people who are at higher risk of contracting various opportunistic infections including Bartonella. Bartonella is prevalent in human and animal populations in Gauteng, South Africa, and could be responsible for a number of unresolved or misdiagnosed diseases in immunocompromised patients. Although the broad-spectrum antibiotics offered to HIV-positive patients in particular maybe suppressing the infection, the treatment would have to be constant and there are possible side-effects that could cause the patient more discomfort. It is important to emphasise that immunocompromised patients be very careful when handling domestic animals. Furthermore, attempts should be made to decrease the risk of rat exposure. By keeping food in sealed containers off the floor, and ensuring proper sanitation in and around the home is followed, the household rodent population would be largely reduced. Too little is known about Bartonella and further research is required to fully understand the extent of disease related to this emergent pathogen. It is with gratitude that we would like to acknowledge the following; firstly the staff of SBPRL - CEZD for their support and assistance with the project, Mr Justice Matebula (Laboratory aid) who assisted with the translations and explanations of the informed consent in the recruitment of volunteer participants, the HIV-clinic councilors and phlebotomists for their assistance with translations, explanations and recruitment of HIV-positive volunteers as well as specimen collection, and to the staff of NICD and the animal shelter (wished to remain anonymous) for 'bleeding' for the cause. The animal shelter is furthermore thanked for assisting us with obtaining the cat and dog specimens. A special thank you is owed to Mr Lee Ashford and his enthusiastic staff at 'Scientific Supakill' pest-control company for providing us with the live rodents. And finally thank you to the NICD/NHLS for their support and use of facilities in this study. The authors declare that they have no financial or personal relationship(s) which may have inappropriately influenced them in writing this paper.